For over 30 years, Alan Wright has been a steadfast, passionate, ground breaking advocate for teaching improvement in Canadian universities. 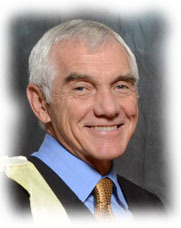 His contributions to the field include a striking number of “firsts:” jointly establishing the Green Guide Series, internationally promoting teaching dossier development, creating a SEDA-recognized university teaching certificate in North America, and becoming the first Vice-Provost, Teaching and Learning, in Canada. He has worked to bridge the divide between Canada’s two linguistic and cultural solitudes, building networks between francophone and Anglophone educational development communities. Throughout his career, he has brought Canadian and international academic developers together, to ensure that national initiatives are informed by the international context. Alan has been a committed member of STLHE for 25 years, as well as a member of its Board of Directors, and the Educational Developers Caucus. Colleagues from across the country attest to his pervasive and sustained influence; his patient, engaged mentorship; his breadth of knowledge; his commitment to the academic community and to learners; his unique perspectives; his professionalism; his drive for excellence—and his sense of fun.